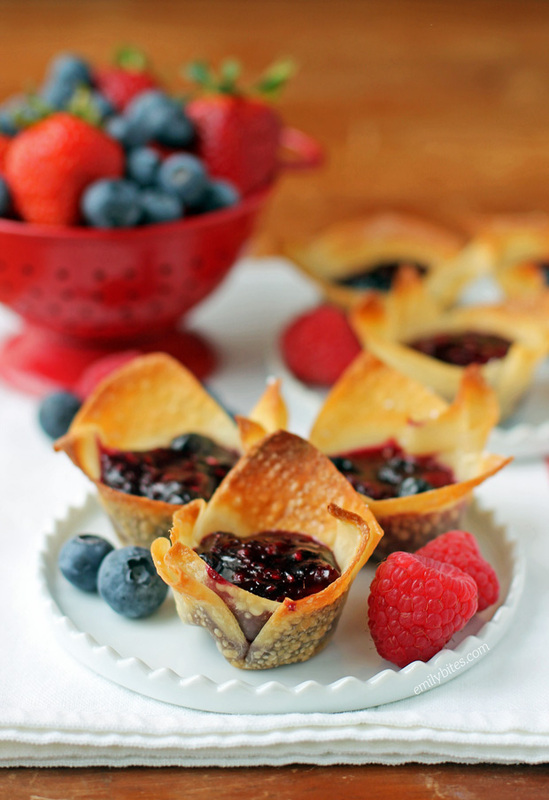 I’m not going to beat around the bush, you need to make these Mixed Berry Mini Tarts. You just do. They’re like the little two-bite pies of my dreams. They’re super easy to make, come together in around 20 minutes, and the warm, gooey berry pie filling nestled in a crispy wonton shell is going to make your taste buds very happy. I have been craving pie lately (Pi day was yesterday and all) and these little Mixed Berry Mini Tarts gave me just what I wanted. Better yet, these are only 39 calories or 1 Weight Watchers SmartPoints each. A dessert for just 1 SP? That’s what I’m telling you! You can also easily halve this recipe to make 12 mini tarts if you prefer. I used strawberries, raspberries and blueberries and the flavors were absolutely perfect, but feel free to mix in blackberries or rhubarb or whatever else you like in your berry pies. I based this recipe off my popular Mini Apple Cinnamon Tarts, so if apple pie is your thing, check out that recipe as well! Pre-heat the oven to 350. Lightly mist 24 cups in a mini-muffin tin with cooking spray and set aside. On a cutting sheet, a sheet of parchment paper or a clean, dry surface, lay out the wonton wrappers. Lightly mist the wrappers with cooking spray and then sprinkle with half of the powdered sugar. Flip each wrapper over and mist these sides with cooking spray as well. Sprinkle the remaining powdered sugar over the top so that both sides are sugared. Push each wonton wrapper into a slot of the mini muffin tray to form a cup. Bake in the oven for 8 minutes until brown and crispy. While the wonton cups are baking, bring the butter to medium heat in a medium saucepan until melted. Add the berries and stir to coat. Cook uncovered for about 5 minutes, stirring occasionally. In a small dish, combine the corn starch and hot water and stir together until well combined. Pour the sugar and the corn starch slurry over the berries and stir to combine. Place the cover on your saucepan and once the mixture is bubbling (shouldn’t take long), reduce the heat to low and simmer for 3-5 minutes until the mixture thickens. Spoon the berry mixture evenly into the baked wonton cups and return them to the oven for another 3-5 minutes. This speaks to my soul! Looking forward to trying it! YUM!! Love the low points. Omg. Just omg. These are so so so so good. I used frozen mixed berries..and it worked great. My question is, since there are so many how do you store them? I wonder if they will stay crisp? Gosh, I could eat them all right now. All.of them. Haha, I’m so thrilled that you loved them! There are a few things you can do to store them. You could freeze them, you could keep the filling and the baked shells separate and then combine them before to eat them, or you can store the assembled tarts in a tupperware. I put mine on a cooling rack on the counter with a paper towel over them for a few days and we gobbled them up from there ;). The tops should stay crisp. The filled part may get softer, but should still be tasty! Hope that helps. Glad to hear you enjoyed these!